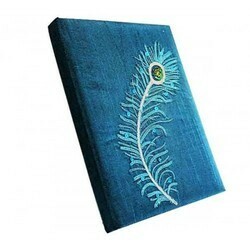 Looking toward the ever growing demand of our customers, we are engaged in offering a wide range of Handmabe Fabric Diary (Peacock Fabric Diary). This product is extensively used in different regions and its unique design gives attractive look to the product. Handmade Paper diary with colorful Indian Silk Sari Fabric. These traditional diaries are perfect gift for your beloved. The diaries are made in Euro pattern and Bahi Pattern with button closure and string closure. We are the well known manufacturer and exporter of Fabric Diaries which are high on demand in the market and have been made using creative ideas. Price Range: 200.00 to 500.00 Rs./Piece. Our customers can purchase from us Printed Fabric and Hand Made Paper Diaries, Item Code: VDC-CO-OO-TA171. These are quality tested on different parameters. We have an advanced production unit, where these are made in bulk. Our customers can purchase these at market leading prices. These are available in various colors paper with the adornment of blooming flowers and leaves. 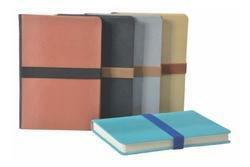 Offered diaries are highly appreciated for their smooth finish and perfect stitching.